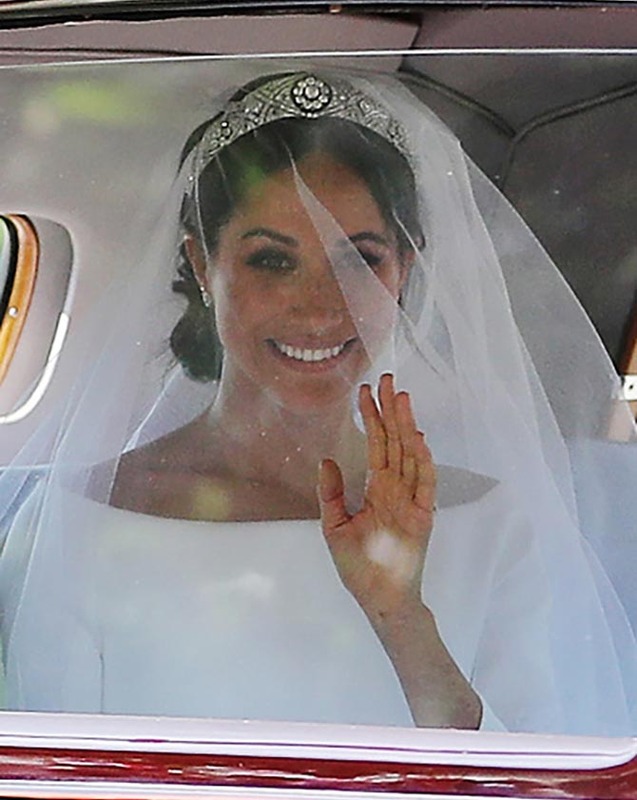 After months of speculation about what tiara Meghan Markle would wear on her wedding day or if indeed she would wear a tiara, the American actress appeared in a piece that to my knowledge wasn’t on anyone’s radar. Proving yet again the royal family knows how to surprise the public. 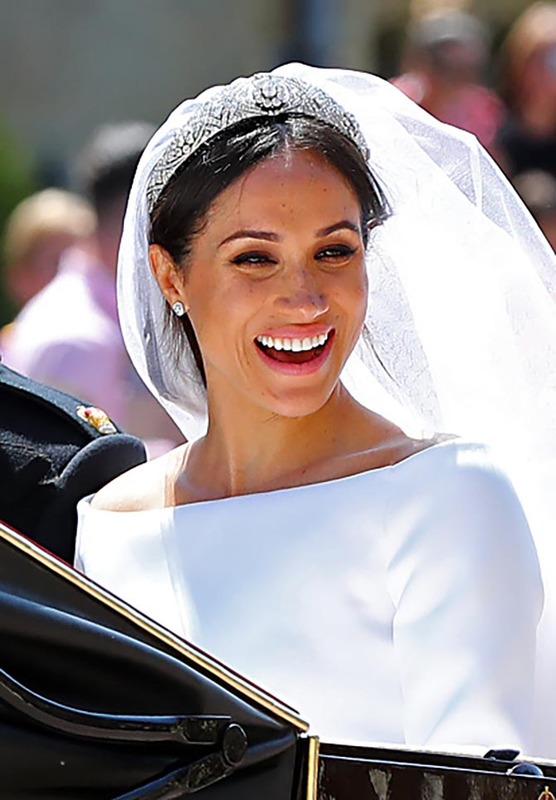 Meghan’s diamond and platinum tiara bandeau was “something borrowed” from the Queen who inherited it from Queen Mary in 1953. Known as Queen Mary’s diamond bandeau, the English jewel was created in 1932. It centers on a brooch made in 1893 originally given as a present to the then Princess Mary by the County of Lincoln on her marriage to Prince George, Duke of York. Meghan’s earrings were something new and the jewels I predicted she might wear for the wedding. She debuted the diamond and white gold Galanterie de Cartier studs a few weeks ago. The designs looked different enough from her regular jewels that I thought they might be a possibility. In addition, the white metal suggested a bridal color palette. 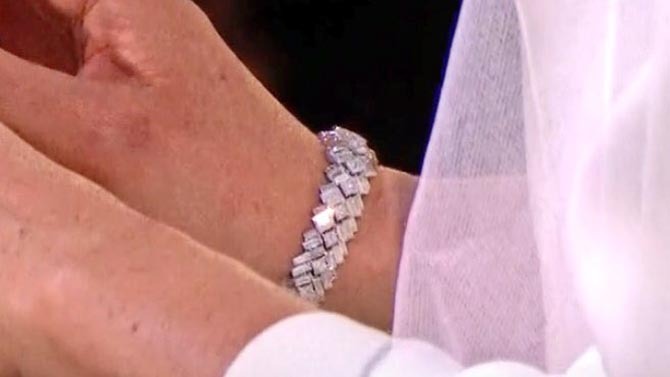 Meghan also wore a dramatic Reflection de Cartier diamond bracelet. The rendition of the jewel on the Cartier website is composed of 18K white gold, set with 104 brilliant-cut diamonds totaling 4.50 carats, and with 52 baguette-cut diamonds totaling 5.61 carats. The wedding band Harry slipped on Meghan’s finger was made of Welsh gold gifted by Queen Elizabeth. 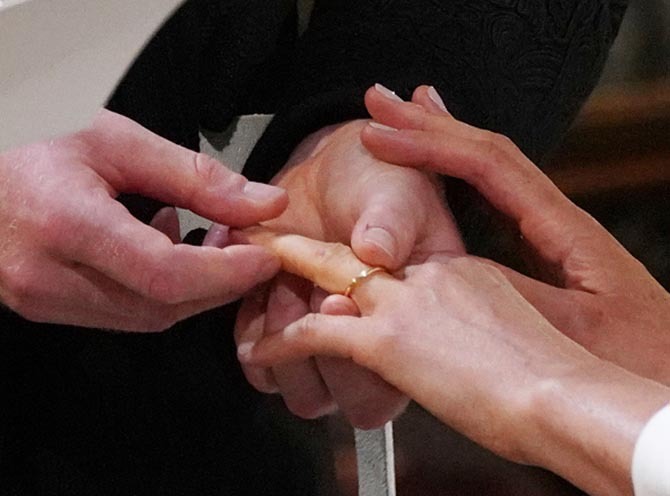 Prince Harry’s wedding band is crafted in platinum and has a textured surface. 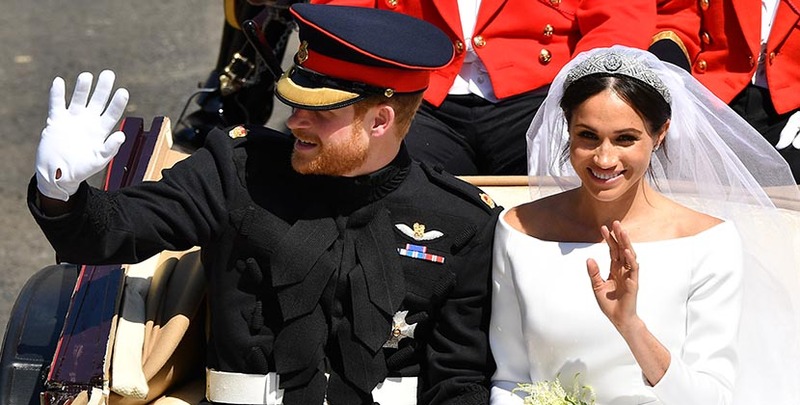 Both rings were made by Cleave & Company, the same jeweler who created Meghan’s three-stone diamond engagement ring.